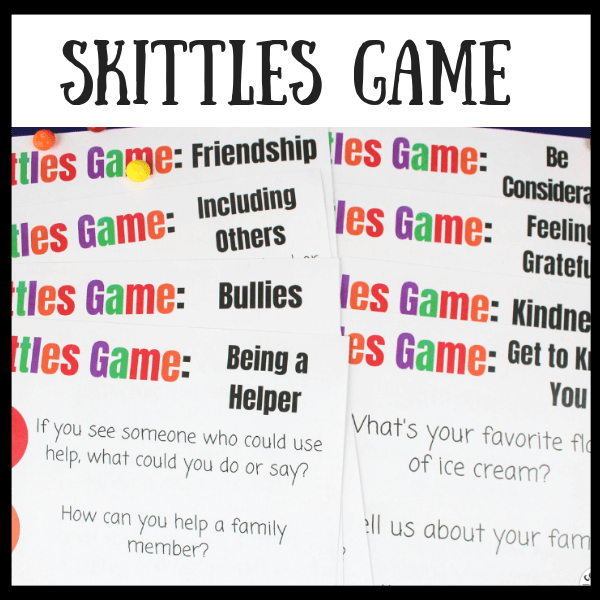 Inside: Use this Skittles Game printable to talk to your kids about kindness, being a good friend, bullies and being a helper. My third-grade son came home with stories of being teased by his “friends” the other day. Apparently, he’s been assigned to be reading partners with one of the sweetest girls ever and he’s getting teased that he likes her. These boys have been relentless in their teasing. So we had to have a couple of big conversations with my son about friendship and kindness. If these boys are teasing you and you’ve asked them to stop are they really good friends? What would a good friend do instead? How does it feel to be teased? 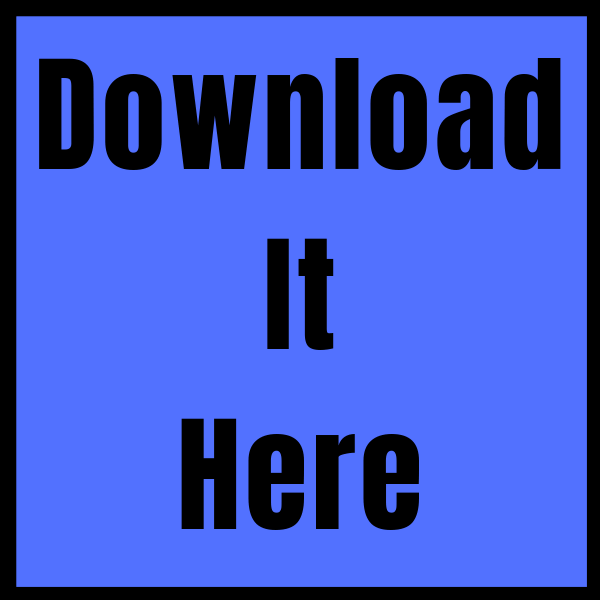 What can you do instead of teasing your friends? And then we had to talk about this sweet little girl who’s getting mixed up in all this boy drama. My son could make a big deal about how he doesn’t like her at all and how he would never like her. He could easily throw her under the bus and make fun of her to fit in with the boys. Or he could strongly say, “We’re just friends” and ignore the rest. So we talked through each statement and how they might affect her feelings. We talked him through how to handle this oh too common situation so these boys will leave him alone and he still acts like a good friend to his reading partner. But these are hard conversations to have with our kids. Because frequently, we don’t have the conversations in time. Something happens at school and before we can help our kids through it, they’ve already handled it. And often we realize after the fact they could have handled it in 20 other much kinder ways. So we have to have conversations about kindness and friendship BEFORE our kids need them so they have the tools they need. Our kids need to be equipped to handle tricky situations or tough situations or mean kids with grace, confidence, and kindness. So we started using this old game that I play at every Girl Scout meeting I lead to get to know my girls better. 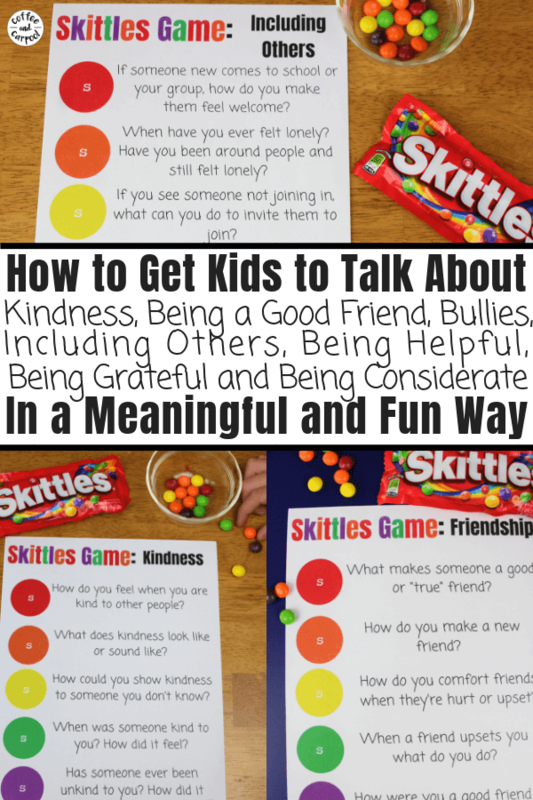 We revamped it to talk to our kids about kindness and friendship and some other tricky topics like bullies and being an includer. We are on purpose, intentionally raising our kids to be kind. There are 100 reasons why we want them to be kind and to be a good friend. Kind people make the world a better place, one smile, one door held open, one crayon shared at a time. Kindness is contagious and has a ripple effect. 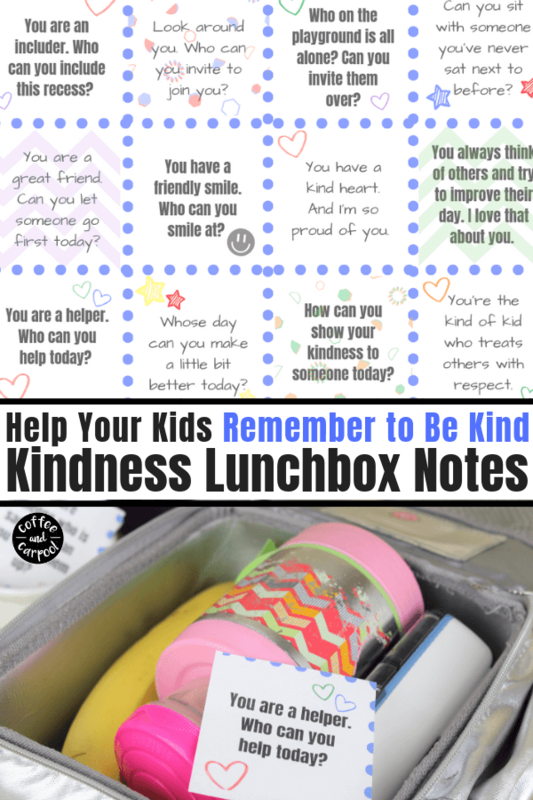 So my kids’ small acts of kindness will have a bigger impact than they’ll ever even know. And I want them to be the kind of people who go out of their way to be considerate and helpful to those around them without expecting anything back. People who are kind attract kindness. 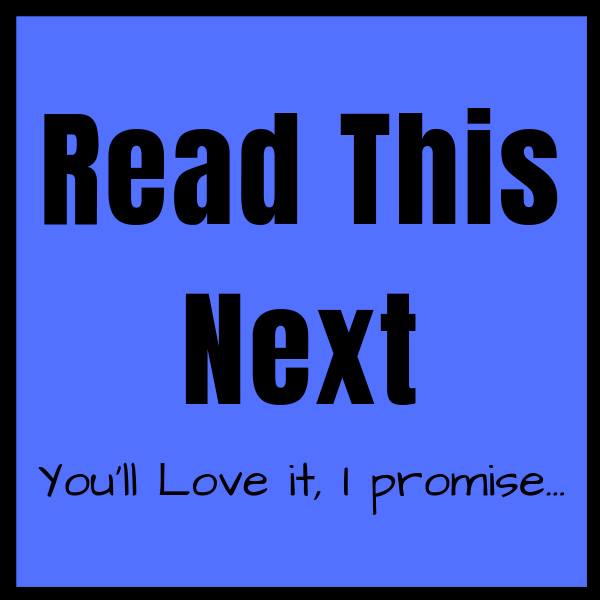 When they’re kind, other people will be kinder to them…eventually. And science has proven that people who are kind, are happier people. So kindness is like a vitamin. Taken daily it makes you feel better and can help those around us feel better too. So we encourage our kids to be kind. In fact, it’s one of our only two family rules. We invited the Kindness Elves into our home. And we give our kids gifts that help encourage them to be kind. 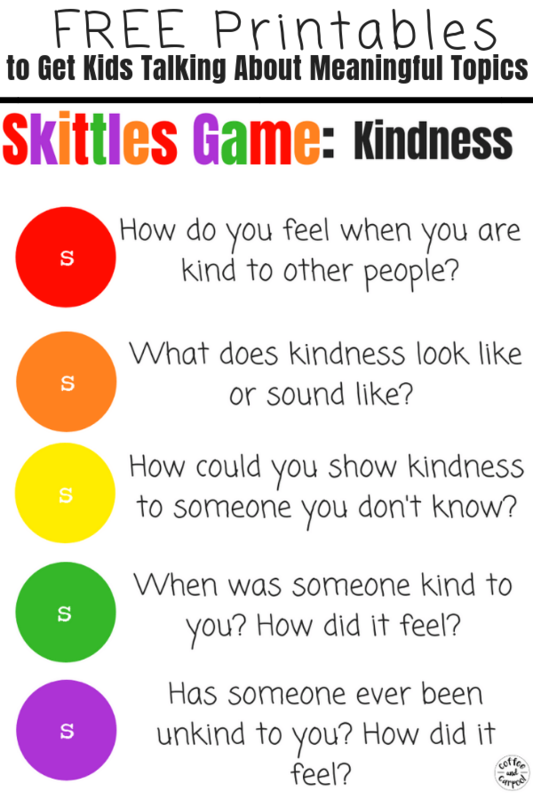 And we have discussions about kindness and what it means to be a good friend using the Skittle Game. 2. Randomly hand out Skittles to everyone at the table so everyone has a different color. 3. If someone has a yellow Skittle, when it’s their turn they would answer the yellow question. 4. Continue a discussion about their answer or help them brainstorm solutions to a problem. 5. Then the next person would go and answer the question that matches their Skittle color. 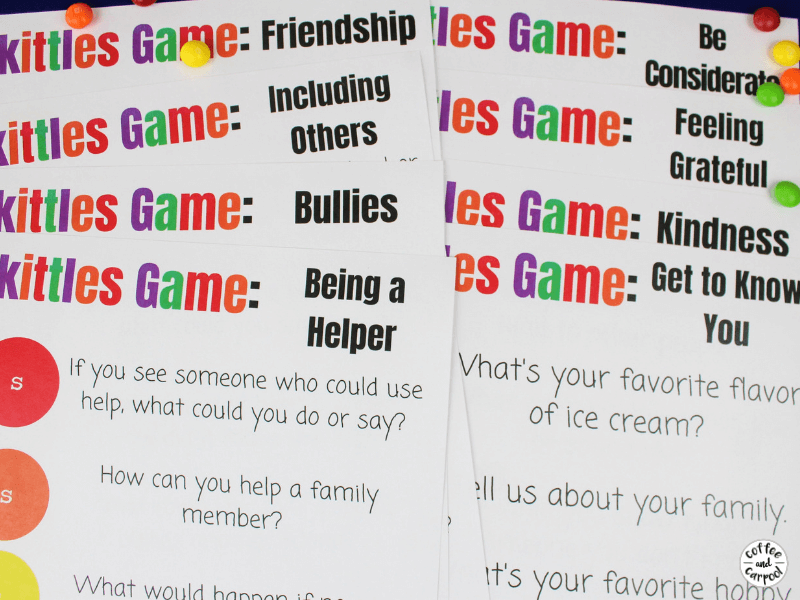 Ready to play and start having meaningful conversations with kids about kindness and friendship? 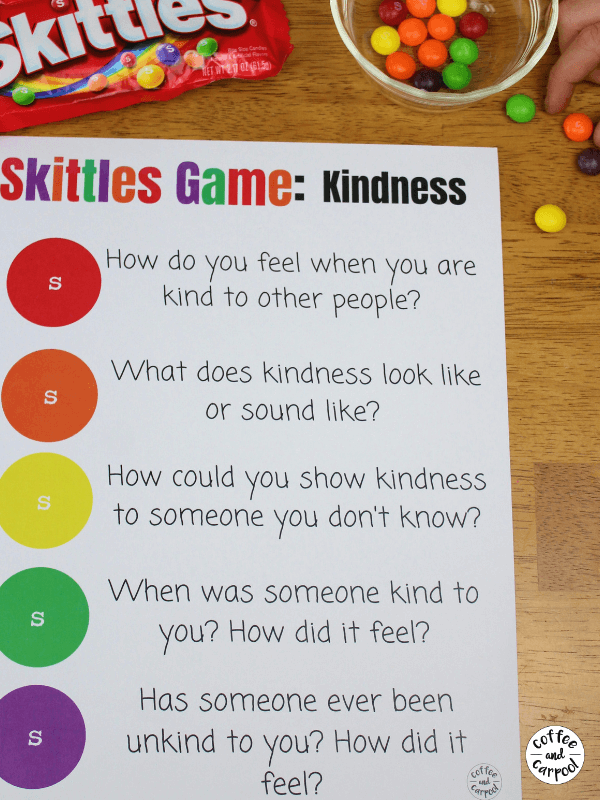 OR Download the Kindness and Good Friend Skittle Game here.